Pork shoulder is one of the cornerstones of American barbecue—right up there with brisket and ribs. It’s certainly the most flexible: you can smoke it. Indirect grill it. Spit-roast it on a rotisserie. It’s also the most forgiving: it stays moist even when you overcook it. And in my book—make that books!—pulled pork is pork shoulder’s highest calling. 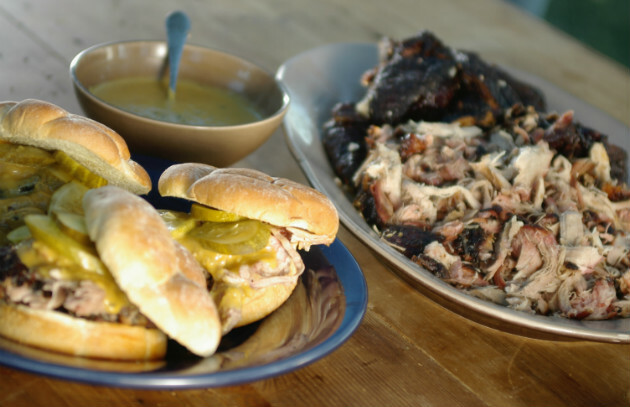 Rubbed with salt and spices, blasted with wood smoke, periodically mopped with vinegar or beer, and finally, shredded with meat claws or pulled into meaty shreds while finger-blistering hot (insulated food gloves are a big help here), pulled pork has only to be sauced to reach its full potential. “Pig Pucker Sauce,” aka, North Carolina Vinegar Sauce: Enthusiasts of North Carolina-style barbecue are well-acquainted with these thin, piquant vinegar-based sauces that were popular in George Washington’s day and that are a still a staple in the eastern part of the state. Salty and puckery, to be sure, but they deftly cut through the fattiness of the pork while adding heat. (Most contain red pepper flakes.) Ketchup sometimes reddens the sauce in Western North Carolina. South Carolina Mustard Sauce: South Carolina-style pulled pork was influenced by 19th century German immigrants, who thought mustard and pork were inseparable. So they sauced their pork with their favorite condiment, which they mixed with vinegar and sweeteners like molasses or brown sugar. (Commercial varieties of this sauce are sometimes called Carolina gold barbecue sauce to distinguish them from the red sauces familiar to most Americans.) Cheap yellow mustard is commonly used in the sauce; I personally prefer Dijon. I’m a Yankee—what can I say? Texas: In some of Texas’s most famous barbecue joints, there are penalties for saucing meats—not the least of which are dirty looks from locals. But Texans occasionally sanction a sauce made from meat drippings, ketchup, beef stock or bouillon and/or coffee, and spices like cumin and chili powder. Be sure to rack your pulled pork over a foil pan during the cook to preserve the drippings. Alabama “White Barbecue Sauce”: Since 1925, Big Bob Gibson’s, a destination restaurant in Decatur, Alabama, has been serving its distinctive white barbecue sauce. It’s a peppery blend of mayonnaise, cider vinegar, horseradish, and spices (mostly black pepper). Sounds strange, I know, if you grew up on red sauces. But it’s great when mixed with pulled pork, especially when topped with crunchy coleslaw. Kansas City-Style Barbecue Sauce: This style of sauce defines barbecue sauce for the majority of Americans. (It was also one of the first to be sold in stores under the brand names Open Pit and K.C. Masterpiece.) Ketchup-based with a little vinegar, sweet with molasses and brown sugar, and dosed with liquid smoke, it’s one of the country’s most popular condiments. Like the barbecue sauces profiled above, it’s a natural with pulled pork. Sauce the pork after it’s been pulled or chopped. Go easy—you don’t want the pork to be gloppy with sauce. What’s YOUR favorite sauce for pulled pork? Share your thoughts with us on the Barbecue Board.